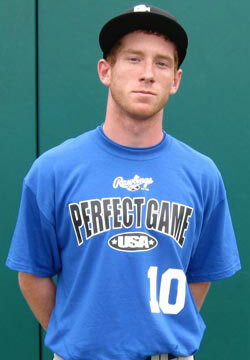 Nathan McBroom is a 2010 OF/P with a 5'9'', 145 lb. frame from Roxboro, NC who attends Pearson Co. Lean athletic build, room to fill out some, fast-twitch athlete, 6.78 sixty, sound hitting approach, short simple swing, bat is quick through the zone, good load and leverage, makes hard line-drive contact, high energy player in the field, quick release in the infield and outfield, gets after the ball, soft hands, solid overall infield actions, clean delivery on the mound, repeats well, feel for 12 to 6 curveball, changes speeds well, solid student.